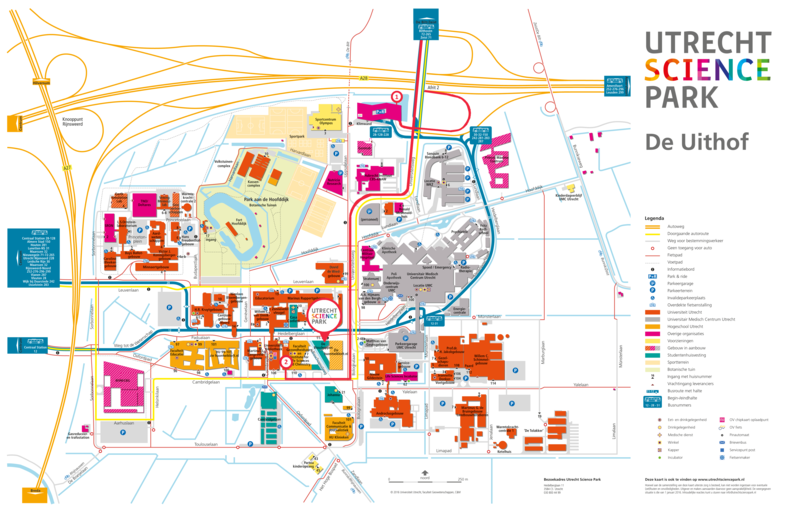 Utrecht Science Park is centrally located and easily accessible by both car and public transport. Amsterdam Airport Schiphol is just forty minutes by car. During the day, (especially on Monday, Tuesday and Thursday) we would advise you to park at the car park P+R Utrecht Science Park at Uppsalalaan 6. This car park has plenty of space to park your car, and from this garage you can either walk to tour office in a ten minute stroll, or take the bus to the bus stop Heidelberglaan. The daily fee of the garage is €4,50. In case you wish to travel further by bus,the dailee fee is €5,00. In the afternoon and evening, you will be able to find a parking spot in the car park of the University Library. The entrance is at the back of the building. Once you've parked your car, walk towards the exit 'Heidelberglaan', go right on the Heidelberglaan and after approximately 100 meters, you will encounter a dark grey building. You will find our office in this building. e a dark grey building. That is where Stichting Utrecht Science Park is located. Utrecht Science Park is easily accessible by bus from Utrecht Central Station and various smaller regional train stations. A large number of bus services from surrounding municipalities also stop at Utrecht Science Park. Bicycles are the most frequently-used and sustainable means of transportation to Utrecht Science Park. Utrecht Science Park features a large number of bicycle storage areas. Bicycles may only be parked in these designated areas. Visitors to Utrecht Science Park can also rent public transport bicycles (OV fietsen). See the below link for an overview of the locations. Utrecht Science Park can be reached by car via the A28 motorway, exit 2. The Uithof tram line (de Uithoflijn) will serve as the main transport link for Utrecht Science Park. As of 2018, the tram will connect Utrecht Central Station with Utrecht Science Park by means of an 11-minute service. The Uithoflijn project organisation is currently realising the tram line on behalf of the province of Utrecht and municipality of Utrecht.